Looking for the world-famous Disney Castle in Germany? Don’t worry friend, I’ve got your back. Now here’s the honest truth: if I could live out my life as a Disney movie, I would. Sadly, I don’t get dressed by bluebirds in the morning, plus my fairy godmother has mysteriously gone AWOL. I suppose that’s why Neuschwanstein Castle is the closest I’ll ever get to living out my princess dreams. And despite being one of the world’s most famous German castles, what’s not at all well known is its actual name. 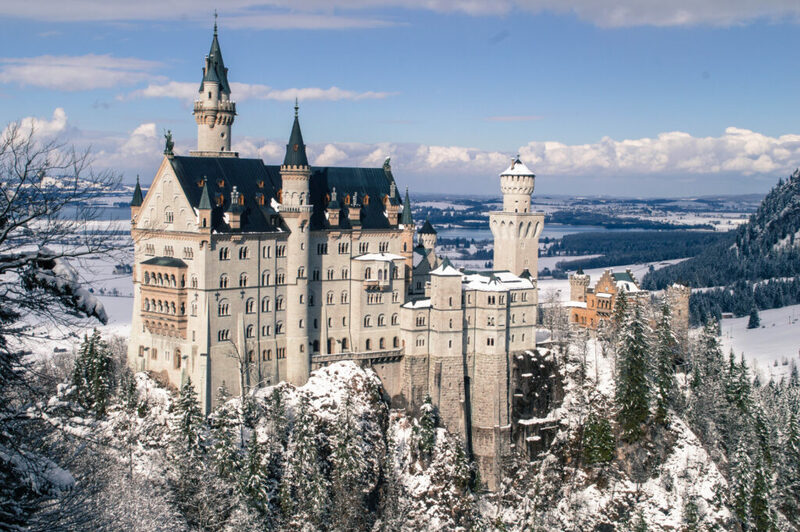 Most starry-eyed dreamers will refer to it as the “Sleeping Beauty Castle Germany” or “Cinderella Castle Germany”… and sure enough, it’s this exact castle (with its majestic exterior, decadent decor and spectacular alpine setting) that supposedly inspired Walt’s iconic creation. But make no mistake, its official name is Schloss Neuschwanstein, or Neuschwanstein Castle. And perched atop a rocky ledge in the Bavarian village of Hohenschwangau, Neuschwanstein’s beauty has a magnetic allure that draws over a million people to its grounds every year. 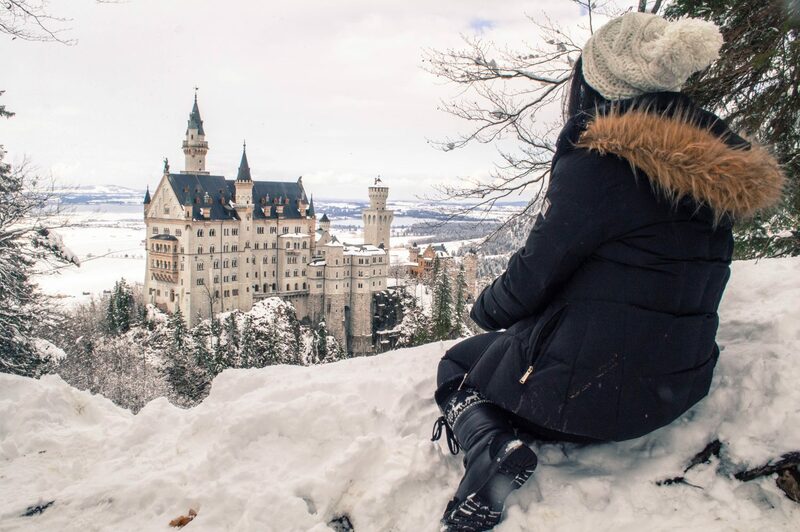 If you’re one of the millions visiting this year, read on for a full guide on how to make the most of your visit to Neuschwanstein, including how to get there from Munich, where to take the best photos, and more. 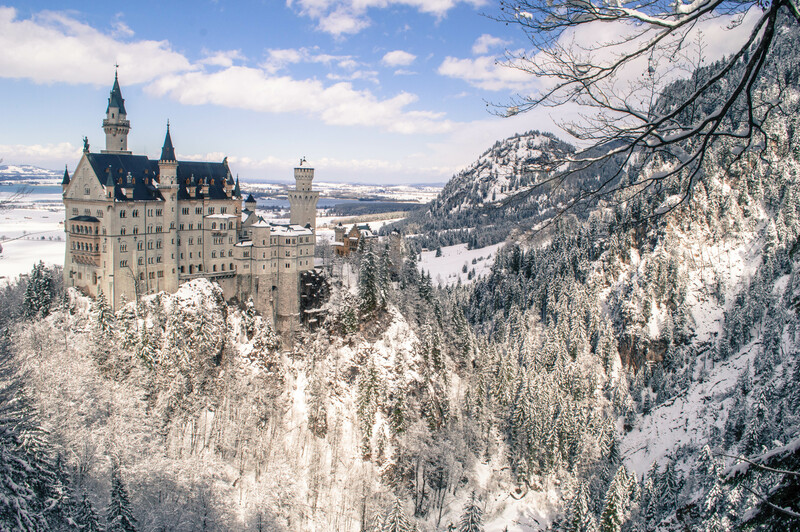 NOTE: If you’re still planning your trip to Neuschwanstein Castle, here are a few recommendations for you. If you value convenience above all else, there are many tours that offer this trip, alongside the beautiful Linderhof Palace, which is tougher to reach by public transit. You can browse the options here. Alternatively, if you want a great website to compare/book transport options in Europe, I always use GoEuro to find the best deal (for free!) and HotelsCombined for accommodation. Built in the 19th century for the eccentric and mysterious ‘Mad King’, Ludwig II, Neuschwanstein was meant to be a place of escape and recluse. The king was obsessed with creating the perfect castle of his dreams, and so decided on the picturesque setting of the Bavarian Alps to make his grandest fantasies come true. Sadly, Ludwig II never got his happily ever after. He died in 1886, before the castle could be completed. A few weeks after his death, the castle was opened to the public as a museum, and continues to welcome thousands of visitors each day, now lovingly known as the Disney castle in Germany. It has always been my dream to see Neuschwanstein in the winter, and despite a relatively snowless few months in Bavaria, somehow the stars aligned for my recent visit. A fresh snowfall the day before my trip paved the way for a perfect Neuschwanstein Castle winter visit, a trip that I think everyone should experience at least once in their lives. So, how do you get to this castle? What is there to do once there? Read on for the answers… Here is everything that you need to know for your own visit. TOURING THE INSIDE: The Neuschwanstein Castle interior can only be visited with a guided tour that lasts around 35 minutes. These tours have limited spots and are booked based on a time slot. Cost-wise, it is € 12.00 for adults. TIP: To save time on the day-of and to guarantee your tour inside Neuschwanstein Castle, you can buy your Neuschwanstein tickets online until 2 days before your visit (though no later than 3:00 p.m German time). HOW TO GET TO NEUSCHWANSTEIN CASTLE (FROM THE VILLAGE): You’ll be arriving in the village of Hohenschwangau, rather than directly at the castle. Keep in mind that Neuschwanstein is located up a steep(ish) hill which takes around 40 minutes to ascend by foot. Alternatively, there are horse carriage rides and shuttle buses that can take you up there. Horse carriage rides cost € 6,00 to go uphill and € 3,00 to go downhill, whereas the shuttle buses cost € 1,80 for uphill, € 1,00 for downhill and € 2,60 roundtrip. WHAT TO WEAR: You’ll be doing quite a bit of walking, so bring comfortable shoes. It can also get pretty chilly up there during the winter, so dress in layers and anticipate quickly changing weather conditions. HAVE ALL THE LATEST INFO: Check online for the latest news about Neuschwanstein, because at times certain roads (or even the main lookout bridge!) may be closed. BY TRAIN: Catch a train to Füssen and from there take either the 73 or 78 bus, getting off at Hohenschwangau. This is where you’ll find the Neuschwanstein tickets office, and from here you can get to the castle by foot, shuttle bus or horse carriage. WITH A TOUR: If making all these arrangements sounds daunting, then of course the easiest way to visit the castle is by booking a tour that takes care of all transportation for you. If you’re booking a tour, I highly recommend GetYourGuide as they have a low price guarantee, which means they’ll refund you the difference if you find a cheaper price anywhere else. It’s an easy way to ensure you get the best price! See options here. While you can visit Neuschwanstein from a wide variety of locations in Bavaria, many visitors treat Munich as a base camp for their trip. 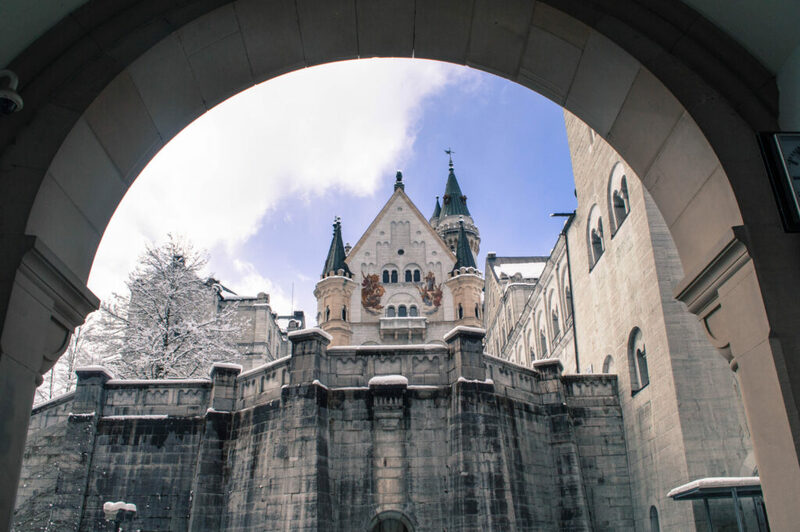 I outline the steps you need to take below, but you can click here for my more detailed guide on planning Neuschwanstein as a day trip from Munich. From Munich, your best bet is to purchase Bayern tickets for Füssen. These special tickets are valid from 9am-3am, and offer one day of unlimited access to regional and local transport within Bavaria. This means that you’ll not only be covered for your train tickets to/from Füssen, but also for the buses that take you to Neuschwanstein. Catch the 9:52am train bound for Füssen from Munich Hauptbanhof, and once there, take either the 73 bus (direction Steingaden / Garmisch-Partenkirchen) or 78 bus (direction Schwangau), getting off at Hohenschwangau. It won’t be hard to find these buses – just follow the crowds of people coming off the train. They will be very clearly marked and it’ll be quite impossible to miss your stop, as everyone else will be getting off! Once at Hohenschwangau, head to the ticket office to pick up tickets for your tour of the castle (if you decide to do one). You should allow for at least an hour before your desired tour time (more during peak season, as it can get busy!). If you take the 9:52am train, I suggest you go for the tour at 1:55pm. 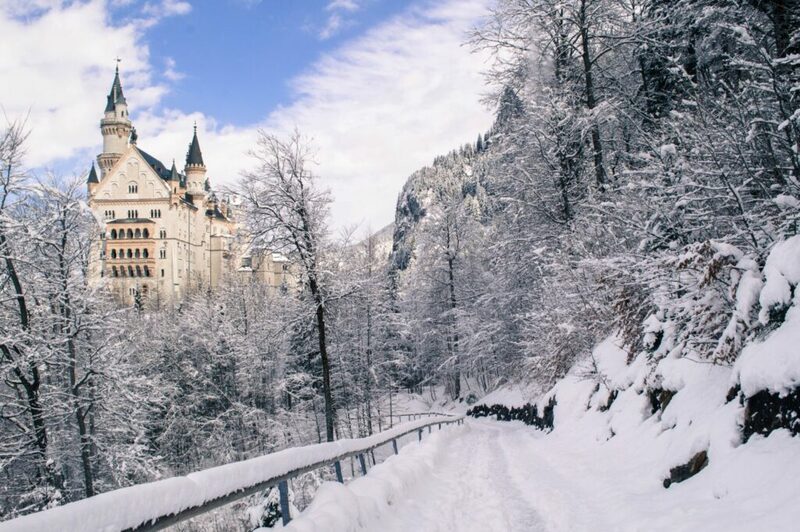 After you have grab your coveted Neuschwanstein Castle tickets, make your way up to the actual castle either by foot, shuttle bus or horse carriage. You should have some spare time to explore the area and grab some gorgeous photos before your tour, which should only last about 35 minutes. After the tour, walk further up the path and enjoy the postcard perfect view from Marienbrucke (or other viewpoints nearby). 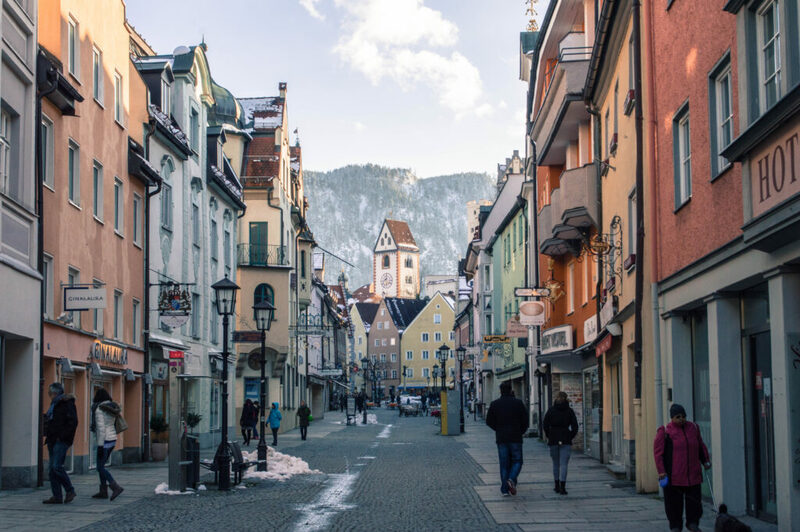 When you feel like you’ve had enough of the view (which is never, to be honest), head back into Füssen and spend some time exploring the town. A few points of interest include the Altstadt (Old Town), Hohes Schloss and Lechfall. Just be mindful of the time and ensure that you don’t miss the last regional train back to Munich, which leaves at 6:06pm. NOTE: There are trains that leave later, but these are not regional trains, and your Bayern ticket will not cover them. To find the full Munich to Fussen train schedule, visit the Deutsche Bahn website. Pick a less busy day to go. The Disney-esque beauty of Neuschwanstein has one major downside: it is a magnet for big tour groups and travellers from all around the world. During peak season, there’s often over 6000 visitors per day. This of course means that lines get long and you’ll be fighting with countless people to score that perfect photo opp. To avoid this, try to visit during weekdays or the off-season. If you have the luxury of options for your visit date, then checking the weather beforehand is a must. While the castle is nice in any kind of weather, rainy or foggy conditions aren’t exactly ideal. I got incredibly lucky and had bright blue skies and a recent snowfall during my visit. It couldn’t have been better! 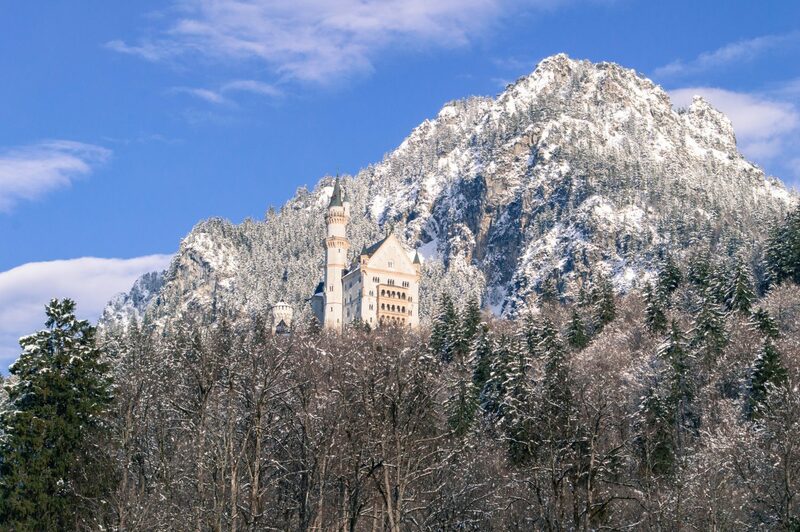 Blue skies and frosty mountains – ideal weather for a Neuschwanstein visit! As previously mentioned, Neuschwanstein is wildly popular, so it’s best that you get there earlier to avoid crowds. Buy your Neuschwanstein Castle tickets in advance, before climbing up the big hill. The official Neuschwanstein Castle tickets booth is located in the middle of Hohenschwangau, at the foot of the big hill where you find Neuschwanstein. On the day-of, this will be the only place you can get your ticket. Alternatively, if you’re sure about your visit dates and times, you can make your reservation online. 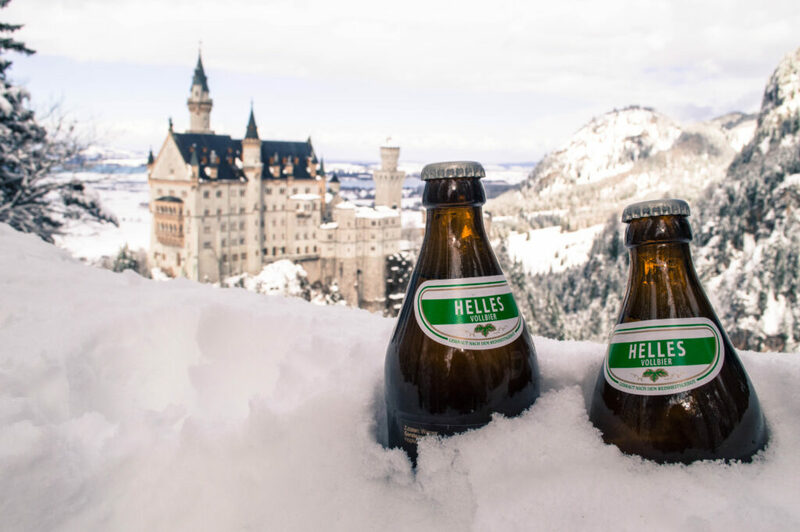 A toast to the best view of Neuschwanstein Castle! We also picked up some quarkballs (quarkballchen) along the way. 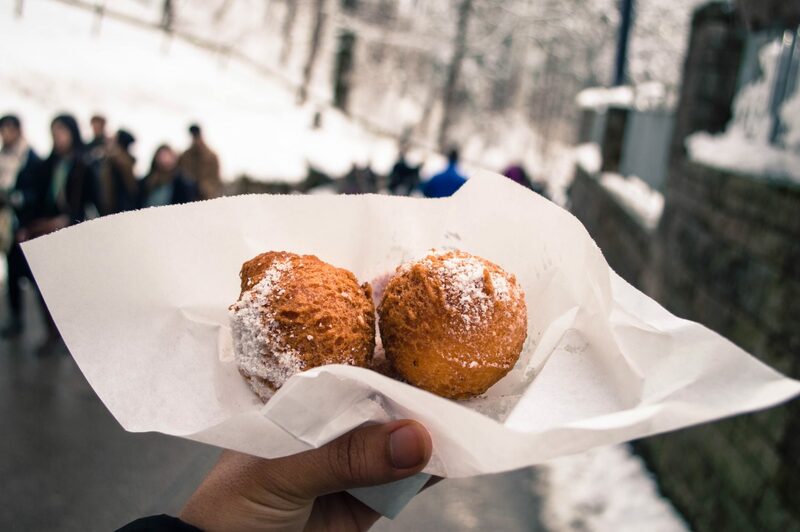 These doughy, deep-fried donut balls are made from a quark cheese batter and then rolled in powdered sugar. In other words, they are little balls of heaven. Try them if you get the chance! Delicious, chewy, crispy, sugary quarkballs! 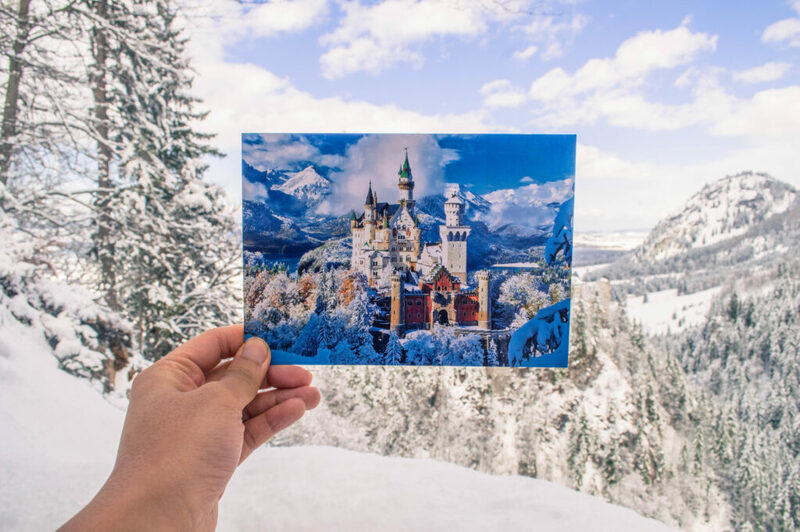 It’s hard to take a bad photo of Neuschwanstein, but you’re definitely going to want your best camera on hand to capture the magic. Phone quality simply does not do this place justice. Set some time aside to explore Alpsee and Hohenschwangau Castle. If you’ve come all the way to Hohenschwangau, you might as well take in some of the other beautiful sights in the area. Luckily, right by Neuschwanstein are Alpsee and Hohenschwangau Castle. Both are very accessible and worthwhile to visit. While I haven’t personally done it, you can take a tour of Hohenschwangau Castle as well (either on its own or through a combo ticket with Neuschwanstein). Any more questions about Neuschwanstein Castle? 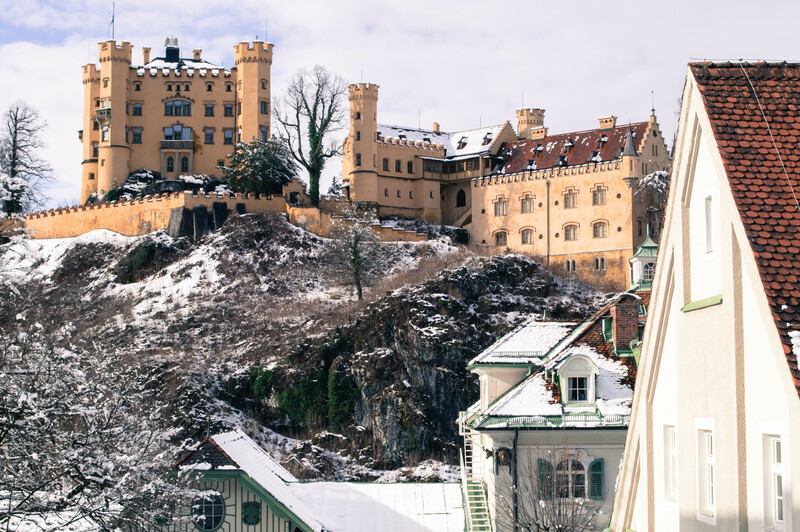 All in all, it may be one of the most touristy attractions in Bavaria, but that doesn’t take away from the fact that it’s a gorgeous castle, ripped straight from the pages of a storybook. Come prepared and I promise that you will have an amazing time. Good luck, enjoy, and don’t forget to snap plenty of photos! i visited in the summer but these snowy shots are stunning!!! Yes! 100% agree that you should buy your tickets in advance. We went there last year and sadly there were not very many English tours. We would have had to wait 4 hours for the next tour and we had a 5 hour drive home… so we didn’t get to see it up close. BUT we are going out that way in December so we will be sure to order tickets so we can see it. Oof sorry to hear that! To be honest though, the tour for me was my least favourite part of the castle. It’s way more spectacular from the outside anyways, and the tour was very very brief. If you’re headed that way this year though, might as well check it out. I think the kids would love seeing a real castle interior! It really is like you’re in a fairytale and those quarkballs! I’d have to have more than one! Mm yes they are so SO good! A perfect treat for when it’s chilly out – alongside some hot chocolate. yum! This is one of my favourite castles of all time. I definitely need to arrange a visit to Germany soon to see it in person. It is so photogenic! Then you’ve probably seen more places in Bavaria than me!! 🙂 Neuschwanstein is a must-visit though, so I hope you visit soon! Thanks Sreeram!! Agh sorry to hear you weren’t able to go. It’s a really popular attraction (for good reason), but hopefully now you’re well-prepared to see it next time. Christina you are such a great photographer! Are you self taught? Absolutely love all of these photos. Hey Holly, thanks so much 🙂 Yes I am self-taught! It’s just a hobby that I picked up about two years ago. Been having loads of fun with it for sure! Fun to read this post from my home. Neuschwanstein is 20 kilometers away from where I grew up. For me it is..well quite the normal sight. Many of my friends actually were tour guides during the summer brak for some extra money. You’re Bavarian! That’s so great. What an amazing area to grow up in. I lived in Munich for a year and always thought to myself that the kids there had the nicest places to play and run around hah. And yeah I know what you mean – when you live somewhere and see the same thing all the time, it’s easy to take it for granted. It must be strange seeing these busloads of tourists come into a spot that you grew up around. 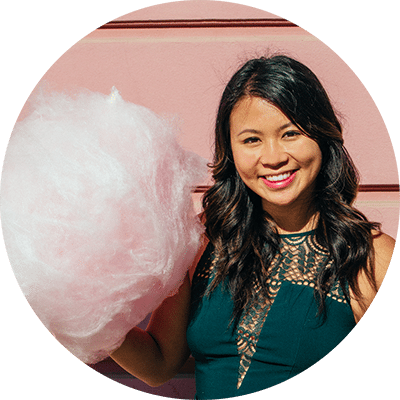 Christina very nice article,i have some questions for you since you know so many things. First of all i am planning to visit Vienna for Christmas so i’m thinking to visit Neuschwanstein Castle on 27/12 ,do you think that i should stay anywhere close to the area(i book to stay in Salzburg) is it quiet close to? what about the weather in December? Hi Katerina, happy you found the article useful! So the closest train station to the castles is in Füssen (and from there you take a short bus ride). While it is possible to travel back and forth between Salzburg and Füssen in one day, the shortest train ride is about 4 hours, so it’ll be a very long day for you (with 8 hours train travel roundtrip). 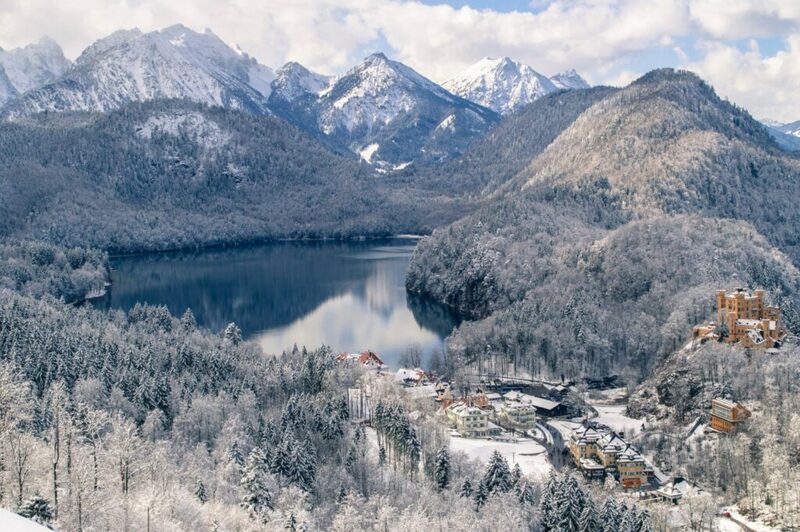 A day trip from Munich would be a lot shorter and simpler, but if that’s not an option for you, then yes there is accommodations in both Füssen and Hohenschwangau (the little village where the castles are). That said, I’m not sure how expensive/busy this option would be (although there is a hostel in Füssen). The weather usually varies quite a bit in December, so it’s best to just wait until it’s closer to the date and check the forecasts. If you’re lucky though, you’ll get a fresh coat of snow like I did (and you can take beautiful photos like the ones in the post!) Note that they do close the paths when it gets too snowy, so you might not be able to get the same vantage point as you see in all the typical photos. Just be prepared for that possibility! Hi Christina, I came across your page as I was searching for tips for visiting Neuschwanstein Castle and the little town around it. Thanks for the good article and guidelines AND the photos especially are breathtaking! One question I have, since this is gonna be my first trip to EU in winter, I’m unsure what boots to get for the German winter. Also what type of jacket is the best to wear since I’m bringing a carry-on luggage only? Any advise will be greatly appreciated! P. S. Am gonna stay in Fussen or Schwangau and take the bus trip to Neuschwanstein. Is this fine? What’s earliest entrance time to the Castle do you maybe know? Hi Priya. I hope you’re excited for your trip!! I’m sure you’ll love it. 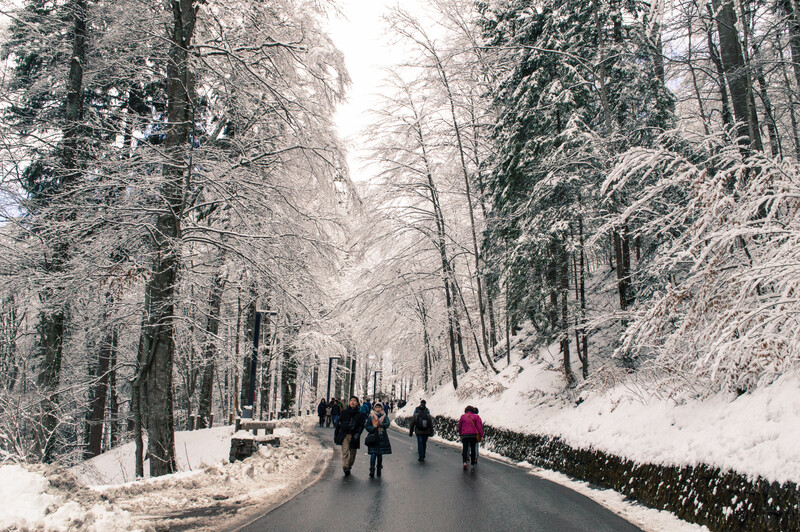 I’d recommend checking weather reports closer to your departure date, since German winters can be quite random, but when I visited in February (which is when these photos were taken), I did need good snow boots because walking up to Neuschwanstein is a pretty long walk uphill. You’ll want ones that have a good grip and don’t slip too easily. A warm jacket is a must, as it gets REALLY cold at night!! You might be limited with carry-on, so I’d recommend bringing a super warm jacket (and wearing it onto the plane so you don’t have to pack it lol), and then a few warm sweaters that you can potentially layer. I didn’t go out of my way to visit the castle when I was in the area a couple of years ago. Friends had told me how beautiful it was, but I also like things to be older… much older! Heidelberg Castle was the best castle I saw In Germany, but I know that’s use the tip of the iceberg! Need more German castle action, that’s for sure! I’ve never been to Heidelberg Castle but WOW it looks so cool. Will have to add it to my list! And yes definitely, you can never have enough German castle action – that’s for sure haha. I think the bridge is open again, but yes when I went, I just headed up another path and found this viewpoint 🙂 Thanks for reading, Edgar! Hi Christina. Loved all the photos and the information you shared. Question, can you tell me location and how to get to the spot in the photo you titled “Perfection” , Thanks!! Hi May, that was taken at a viewpoint that we climbed to because the bridge was closed! I can’t remember the exact location, but it was on the way to the bridge and there was a hill to the left that we were able to climb (after walking around a fence that was put up hehe). Sorry I can’t give more specific directions! This was a while ago. Hi Christina! What a fantastic, comprehensive post! I thoroughly enjoyed it! It’s been nearly 20 years since I visited Neuschwanstein. During my visit, I stayed in Fuessen and also explored Hohenschwangau. Your suggestions to do so are definitely spot on! I’m looking forward to checking out more of your website! Hi, thank you so much for this wonderful post! The castle looks incredible!! Hey!! That’s so exciting 🙂 I’d of course look at weather forecasts as you get closer to your trip, but to be honest with you, these photos were all taken the first week of March 2 years ago, so snow is a definite possibility!! Make sure you bundle up warm for SURE. If there’s snow, running shoes will probably not be enough, and even if it’s not snowing, it might be icy. I’d highly recommend trying to borrow boots off someone. You might get lucky though and it’ll be nice weather that weekend. It’s tough for me to say. Hope that helps. Best of luck! Hi there, we’re visiting the castle this weekend, I am so so happy to finally see it (I live in southern bavaria and haven’t seen it yet, and I am already 30 years old…) Thanks for the tips! Does it make sense to bring a princess dress for babygirl to wear when inside the castle? She’s a big Elsa fan and I think she might have a lot of fun up there!! Nice post! It is sure a magical place! We also visited Neuschwanstein during winter but I guess we are cursed when it comes down to snow, it had snowed in the weekend before but most of it had already melted. Nevertheless, the view of the snowy mountains was stupendous! Can you access the bridge & other viewpoints without getting the ticket to the castle? Thanks. This post helped kick my partner and I into action and start planning a winter Europe trip! I have a question for you, and didn’t see an advice column during my time combing through your blog. We are planning on coming in to see Neuschwanstein Castle a few days before Christmas (and stay in Fussen! ), and then take a train to Salzburg (Mozart is my favorite composer…I am already dying, I am so excited) to spend Christmas. After staying in Salzburg for about 4 days, we will have about 4-5 days left to visit somewhere else in the vicinity for New Year’s Eve. We are having trouble nailing down a great place to be to ring in the New Year! We’re not the type to really dance the night away (we like dancing, but not clubbing), so something that is fun and upbeat, but not crazy. Do you have any suggestions of places nearby where it may be fun to spend New Year’s Eve? Hey Hallie, so exciting that you’re spending the winter here! I’m struggling to think of an awesome place in the area “known” for New Years Eve, but Budapest is (not too far) and it’s a really cool city with an amazing party scene, so I can imagine that would be a fun place for New Years! In Munich, New Years is this one crazy day of the year where everyone just sets off fireworks and it’s actually kinda scary so I wouldn’t come here haha. I think Budapest would be awesome though! Do you also think that December is a good time to visit? and will this trip take approximately an entire day if our basecamp is from Munich? I’m finally going to see this castle in August and I’m so excited! I’m sure it is going to be absolutely packed so I’ll try to book my tickets a few weeks before to get an early spot. Your photos look absolutely incredible – can’t wait to see it with my own eyes. I will be visiting Munich this December. Will it be accessible in December? As I’ve read that it closes.